Now, here’s an update: more information on the exciting new equipment that Pellegrini rolled out at the Show! TRIMWIRE for the quarry and POLYONE for multiwire slab cutting. The revolution in action! 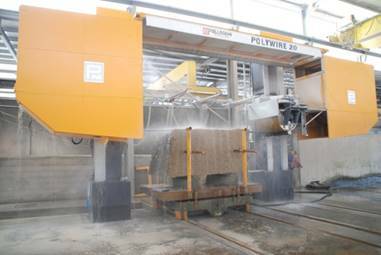 Polyone multiwire machine is cutting 20 slabs of 1 cm using only 10 wires of 5.3 mm diameter. When the ‘impossible’ become ‘possible’. Harmonizes the advantages of a stationary machine with a mobile quarry machine. Very unique, TrimWire is a single wire structure installed on a tracks vehicle equipped with a diesel engine that makes the system independent from any external energy source. The machine is designed to be easily configured for transport from quarry to quarry on trailer. Once the machine has been stabilized on the side of the block by 4 hydraulic stabilizers, the cutting arch is brought to the desired height and opened to align the wire to the face of the block to be cut. The cut is performed vertically thanks to the movement of the arch structure along the column. The wire is driven by a motor flywheel 1000 mm diameter and guided by 600 mm diameter wheels. The entire cutting structure can also move along the rails (4 meters) placed on the top of the vehicle to allow the realization of different thicknesses with a single positioning of the vehicle. All the drives are hydraulic and the main controls are operated by radio control device. 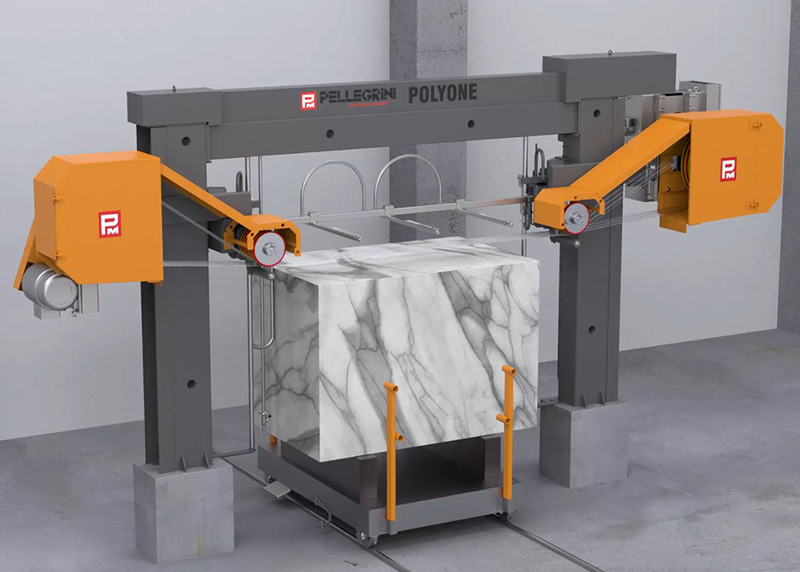 POLYONE, the new revolutionary Pellegrini multiwire able to make 20 cuts of 1 cm slabs in one single shot, or the standard 2 and 3 cm slabs, using only 10 wires was presented at the exhibition Marmomac! The ‘magic’ patented idea behind this machine make it possible to cut twice the blocks per each wire! Proud to find new solutions for our customers. A unique and patented feature of the POLYONE series consists of a special wire winding geometry that allows two cuts in the block for each diamond wire. With the POLYONE 20 version it is therefore possible to obtain 20 cuts in the block with 10 wires to realize 1 cm thicknesses, 14 cuts of 2 cm with 7 wires, and 10 cuts of 3 cm with 5 wires. The compactness of the machine and its geometry allow a minimum need of manpower for the management of the wires, an optimized use of the diamond wire for each material, the 50% reduction of the devices necessary for the management of the wires and a consequent reduction of the maintenance costs. The thickness change is quick through the correct positioning of the wires in the interchangeable multi-groove resin liners. The diameter of the tensioning flywheels and of the motor drum is 1 m, while two 40 cm diameter independent guide-wheels groups assure the support for the maximum precision in the 2 cutting phases for each diamond wire. Pellegrini has new and exciting things to show us at Marmomac!! A revolutionary solution to cut 1 cm thick slabs & more!!! Come to visit PolyOne in Pellegrini’s factory! (They’re only a few minutes away from the fair) Up to 20 cuts of 1 cm thickness each in one drop! For the production of thin slabs, this innovative plant can produce up to 20 cuts of 12 mm thickness; 14 cuts of 21 mm thickness or 10 cuts of 30 mm thickness, and more. Based on the patented technology developed so far on multiwire machines, this machine allows cutting of two slabs for each wire installed. 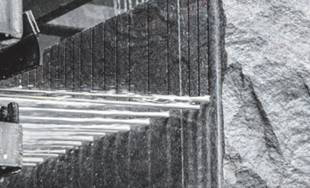 A new frontier in stone cutting! An innovative solution to square blocks & produce slabs anywhere in the quarry! 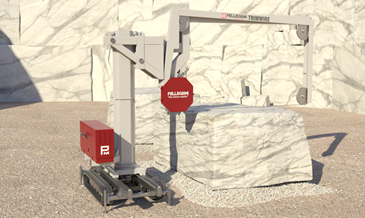 Trimwire is the newest project of Pellegrini Meccanica for trimming the rough blocks and for the production of thick slabs directly in the quarry. 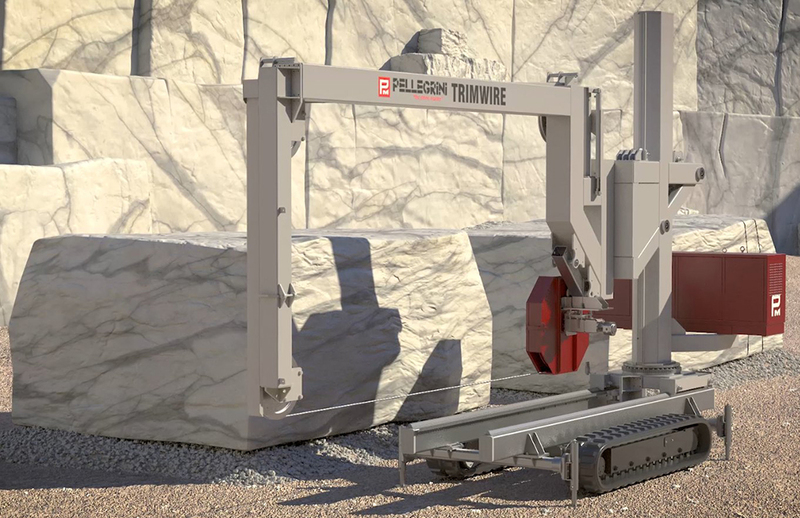 The TRIMWIRE is a portable mobile single wire saw, moves in the quarry on rubber tracks, able to perform whichever vertical cut on the blocks just quarried out. This solution offers flexibility and real savings on transportation costs. The cutting arc can rotate +/- 5° to be aligned with the face of the block. The whole cutting structure can move along 4 meter rails to produce custom slabs. Come see TRIMWIRE at our booth! Big wheels, longer Diamond wire life. The excellence of the multi-wire technology! Come to see this machine at the Show!! Polywire 20 is the best machine to process blocks up to 0,6 meter depth in one shot allowing high flexibility and different thicknesses configuration in a short time (2, 3 & 4cm thicknesses). Configuration of thickness settings are fast. The large diameter flywheel tensioners and the motor drum are patented by Pellegrini, assuring the highest tool life and the best performance. Suitable for cutting both marble and granite, equipped with a motor drum on the tensioning side to grant the best cutting precision! The highest performance with superb flexibility! 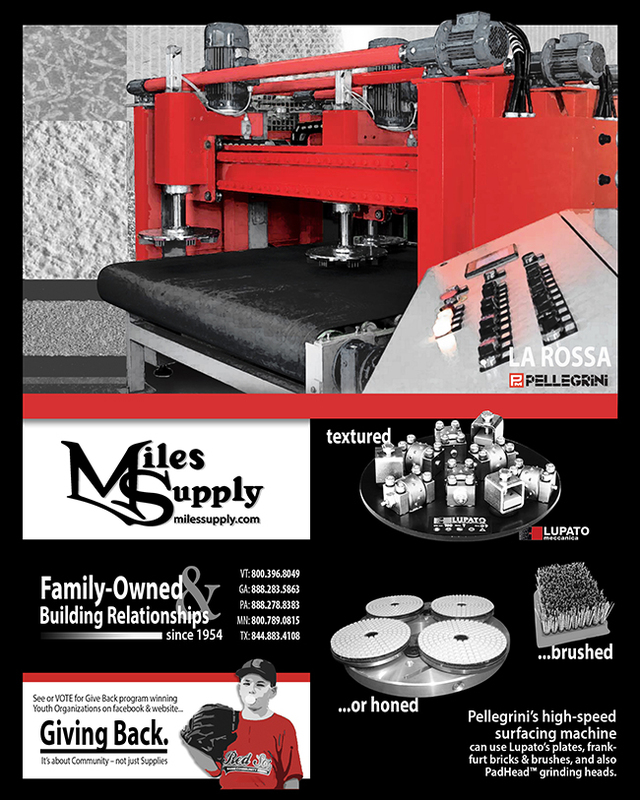 “LA ROSSA”, a compact multipurpose machine for surface treatment able to achieve multiple finishes very easily. The same unit is capable to mix different treatments such as flaming, bush/hammering, sandblasting, brushing, grinding and polishing for a new texturing adventure and very high productivity. Combining machine technology with the excellent tooling of Lupato Meccanica assures superior results. Come to our stand to see this machine and its wide range of samples to open your mind to new frontiers. A grooving finish is now also available!! !